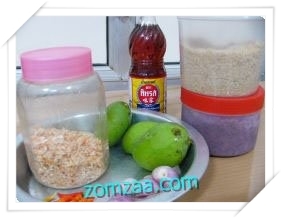 How to make Sweet Fish Sauce for Green Mango ? It’s a Mango seasoning in Thailand ! So I try to make a sweet fish sauce to eat with green mango. This is my mom recipe !, it’s good taste and easier to cook. – Bring red granulated sugar to boil with a few of water (like a boiled sugar syrup) until the sugar is dissolved. 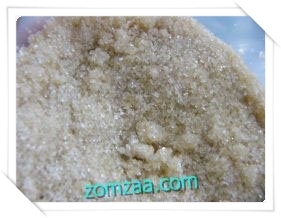 – Melt about ½ tablespoon shrimp paste with a little water, stir until dissolved well. Then put into a pot of sugar dissolved. 2. When shrimp paste cooked well (color have change / check in the picture below) then add a little fish sauce. Taste before and then boiling over medium heat until boiled and turn off. It is not a liquid and not very thick. Smell pungent shrimp paste, salty and sweet. 3. Wash Chilies and shallots, then slice and stir it together. 5. Stir again. We can see that sweet fish sauce more thick. Put down sliced shallots/chili and mix it together. 6. Stored in bottle and sprinkle with a little dried shrimp paste. Store in the refrigerator can keep it for a month. More delicious easy and clean. Try to cook Green Mango Sweet Fish Sauce by yourself !